In Sweden, for most people, Easter has become a holiday for resting, instead of representing a period of abstinence or mortification. Houses, streets and shops are decorated with baby chickens, yellow Easter daffodils and branches decorated with feathers. In the past, when Lutheranism was established, the first priests tried to put an end to the customs established by the Catholic Church, such as abstinence and fasting. Something that did not turn out as expected but on the contrary accentuated this idea of ​​sacrifice. In fact, some generations ago they consumed salty fish and cheeses on Good Friday with the sole purpose of feeling the thirst that Christ suffered on the cross. Even today there are people who do not consume milk or cream even in their coffee on Good Friday. The goal was to create an atmosphere as sad as possible. The Sabbath of Glory, on the contrary, has become the opposite of Good Friday, the day in which the majority of the families organize abundant meals, which many is base don eggs. Possibly you see them, coffee maker in hand, running around the streets with their long skirts and headscarves, looking for sweets or coins. This modern tradition stems from an old Swedish belief, which was that during Easter the witches flew to Blue Hill to meet the devil. Today, despite having become a kind of “trick or treat” for children, remains of this ancient belief about witches are still in the west of the country, in fact, it is common to find bonfires in the fields or hear shots on Gloria’s Saturday night. Since, as we all know, both fire and thunder are ideal to keep the witches at bay. 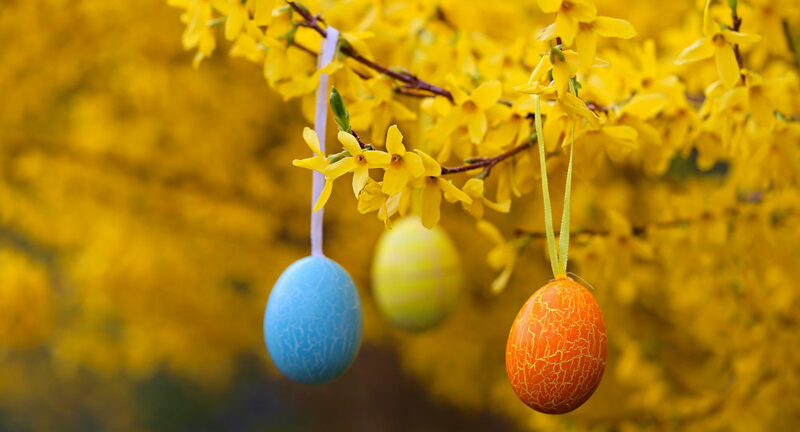 The Easter Branches are one of the traditions that still remains and continues to grow in our days, like the Christmas Tree and the Maypole, but they are really very old customs that have been transformed. In the past, birch branches used to be brought home as Lent approached with the idea that, in the heat of home, they would start to bloom, and thus get some green leaves during Easter. The Lenten Branches, however, did not have leaves and their purpose was that they were used to conflict pain to yourself. An old custom that took place on Holy Friday morning within the families, the person who got up first had the right to hit others with the branches, all in order to remind them of the suffering of Christ. The curious fact is that this practice of giving “branches” among young people was also a strange form of flirting, which was also used at other times of the year. Today, fortunately, we have apps like Tinder The branches are only used to decorate the houses and feathers have been added to make them even more colorful. Beyond the religious meaning or the symbolic interpretation that can be given to Easter eggs, this custom has its origins in the Swedish peasantry. Formerly, during the Lenten period both meat and eggs were products that could not be conserve, but birds did not stop producing them. Therefore, the eggs were stored in the basement of the farms until the end of Lent, becoming the main ingredient of the Easter Sunday menu. The custom of painting eggs arises in the 1700s in southern Sweden, and they were usually sent as presents to employees and friends. The Easter Bunny is just one of the many traditions that were adopted from Germany, where since the seventeenth century there were references to this character. In Sweden, it began to appear in the early 1900s and only in the homes of those German families were eggs were hidden to be found by the children. If u want to know more about the Swedish living and culture, come to our FREE TOURS STOCKHOLM in ENGLISH and discover the city with us!